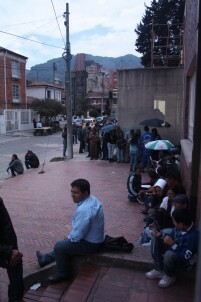 In a landmark victory and possible precedent for waste pickers around the world, waste pickers in Bogota (Colombia) obtain official recognition and payment by the municipality for their service. Those who have already seen our video on waste pickers understand the importance of this victory for thousands of people. Rampant privatization of the municipal waste management systems around the world favors private companies to the detriment of other actors such as waste collectors (so called waste pickers). With recession in the West, the rise of the BRICS countries and the growth of the Clean Development Mechanism, the incineration lobby has moved from the North to the South. This has sketched a doomsday scenario for the informal recycling sector, which happens to be bigger in the South than the North. However, waste collectors have organized locally, nationally and also internationally to fight back. So far, they had won a few battles here and there but were loosing the fight. However, there is some good news from Bogota (Colombia). The Asociación de Recicladores de Bogota (ARB; Bogota Association of Waste-collectors), led by outstanding Nohra Padilla, has fought against privatization in the last decade, including with a successful case in the supreme court. The ARB has managed to fight back the private companies and their abuses, but have lately obtained an even more significant victory which is probably unique (but extensible) all over the world. Not only the waste-collectors have been legally recognized by the authorities (which makes it more difficult to harass them or wipe them out of the system), but the municipality has agreed to compensate them for the service they provide. This is a common sense claim from waste-collectors organizations all over the world: if the municipality pays private companies for the collection and transportation of waste, why shouldn’t it pay also the waste-collectors who provide the same service (and on top of it also recycle)? This recognizes the waste-collectors for what they are: public service providers, so that they should be correctly compensated (be it the inclusion in welfare schemes such as social security, provision of infrastructure or direct payments). The Municipality of Bogota has opted for direct payments with an agreement signed by the Mayor of Bogota on the 18th of December 2012. So that, the Special Administrative Unit of Public Services is developing a process to start the process with the first 1.700 waste-collectors. First there has been a census and then each of the waste-collectors will be provided a banking service called ‘PIN de transfer Ave Villas’, similar to a bank account (which most of them didn’t have) to receive the payments. Waste-collectors will be paid on the basis of the materials they sell to the intermediaries (waste dealers). Any waste-picker can register to the scheme, regardless whether it is a member or not of ARB or any other organization, which avoid patronage systems. For each ton of recycled material collected the municipality will pay approx 81.700 pesos (50 US$), which is slightly less of what the private companies get to collect waste in the city. Nohra Padilla believes that each waste-collector will receive from 350.000 to 500.000 pesos (from 200 to 300 US $), as a remuneration for its work (a part of course, the price of the materials itself). To start with, the waste-collectors will collectively received a sum of about 700 millions of pesos (approx. 400.000 US $). “Not too bad as a start” declares Nohra Padilla, as she knows the value of this new scheme goes much beyond the actual monetary value but has to do with recognition and a more ambitious dream: “To be a waste picker and being proud of it”.